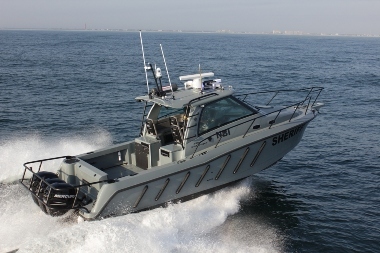 One of the world’s foremost suppliers of combat, law enforcement and rescue watercraft is expanding into Australia. Brunswick Commercial and Government Products (BCGP) has linked with Mercury Marine Australia to service government and commercial agencies across Australasia and the Pacific region. The BCGP has been developing specialised vessels since the 1960s, employing former emergency service, law enforcement and military personnel to assist in their design. Under the new agreement, Mercury Marine Australia will have access to the full line of BCGP models ranging in size from 5-15m, which includes Boston whaler commercial fiberglass boats, impact rigid inflatable boats, and sentry aluminum patrol boats.